My most favorite childhood memories are the times I spent on my grandparent’s farm in the rolling hills of southern Indiana. It is nestled back down a long gravel lane that my great-great grandparent’s once traveled by horse and buggy. My grandma, Dorothy Ann, was born in the farmhouse she still lives in, to this day, with my grandpa, Ovalee August. My dad is the oldest of their eight children. With that many kids, they were bound to have a WHOLE BUNCH of grandkids, and they do. And every single one of us, adores them. This year, these two wonderful people will celebrate 70 years of marriage. There was a time, before my parent’s divorce, where that place, those people, were special to me of course, but they were just one more ounce of goodness, in an already really good life. But, when I turned eight years old, and the happy home I had always known, shattered, my grandma and grandpa and that farm became so much more. It transformed into a safe harbor, throughout the rest of my childhood, and it has continued to be a refuge for me as I’ve weathered many storms as an adult. The first “half” of the grandkids. I’m the 6th oldest and getting ready to nose dive off the couch. I’ve camped in the pines with my dad and my brother. I’ve fished in the pond. I’ve walked that gravel lane more times than I can count to get the mail with my grandpa. I’ve picked honeysuckle to put in flower vases and I’ve picked buckets and buckets of blackberries so Grandma could make cobbler. My love of horses began on that farm as did my love of the fresh country air. My cousins and I spent summer days playing home run derby in the front yard and summer nights were for catching lightning bugs. We built forts with hay bales in the barn loft and like all good Indiana kids, we played a lot of basketball up there too. I’ve helped Grandma snap a thousand beans and I wouldn’t trade that time spent with her under the shade tree for all the riches in the world. I’ve slept under the stars and woken up with dew on my face. I’ve sat for hours sifting through box after box of family photos, soaking in every story they have to tell me about each one. I have cried on Grandma’s shoulder while she soothingly patted my back, as both a child, and as an adult. They have loved me, flaws and all, my entire life. They have been an anchor, a lifeline and their home has ALWAYS felt like my home. It was and still is a place of solace for me. It is also the place I learned to see the beauty in the everyday. To take a deep breath and just BE STILL. To take a picture in my mind’s eye so that I could carry that image in my heart with me during the times I couldn’t physically be there, especially during the hard times. It has been and still is that safe place where I can go and not be questioned, but instead CAN JUST BE. They are magnificent. They love simply, and they love deeply. They are two amazing souls, who live in the quaintest place, my most favorite place, on the map. So, there you have it, folks. 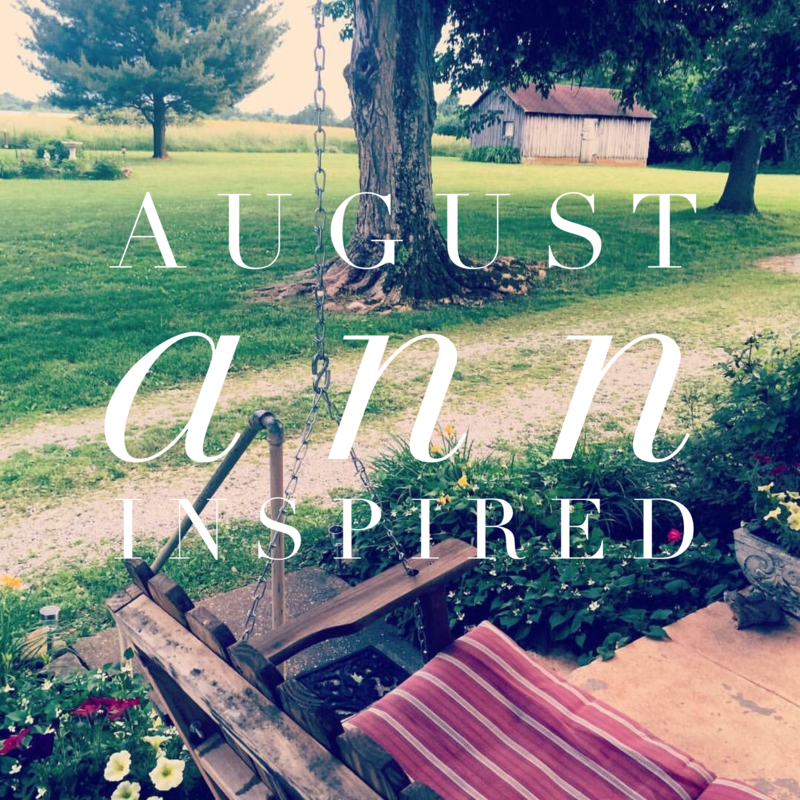 The reason and meaning behind August Ann Inspired. When I told my grandma the name, she just grinned, shook her head and said, “you are something else.” If you say so, Grandma. Beautiful, Katie. You are a blessing to them as they are a blessing to you. Your tribute to those two wonderful people once again brought a tear to my eye.